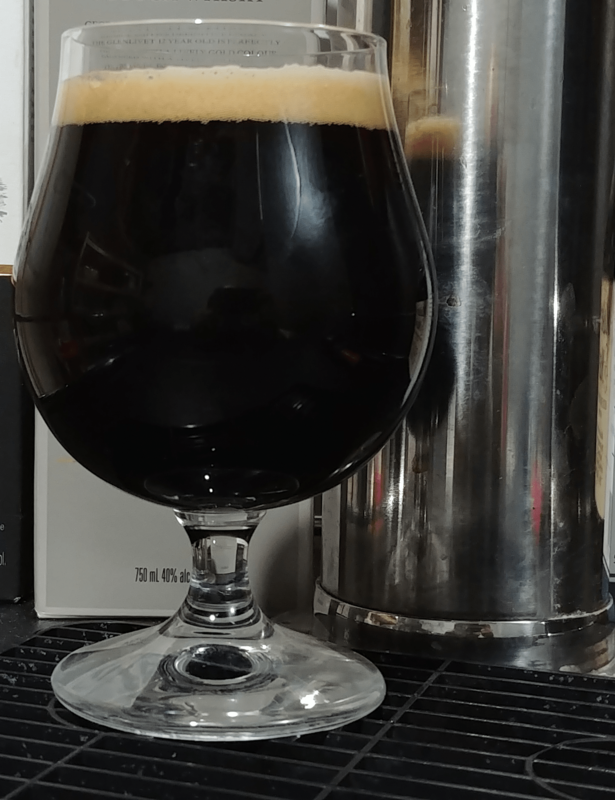 Back in November I oversaw the brewing of a Russian Imperial Stout to fill a whiskey barrel owned by my homebrew club – the London Homebrewers Guild. Not mentioned in that original post was that we had an extra 20 L of RIS wort at the end of that brewday, which I split with the club president and took home to ferment. The only yeast I had on-hand was W34/70, so technically I think this is now a Baltic porter, but after ~2.5 months of fermentation and ageing the beer is done. My version was fermented in glass, and obviously lacks the added complexity the barrel aged version will have, but I think I’ve found on a method to mimic this effect in the home brewery. Appearance: The beer pours midnight-black with a modest tan head. Aroma: Strong roast, coffee and chocolate notes. Minimal hop and yeast aroma. Slight sulphur note, likely from the use of a lager yeast. Flavour: This beer has a strong chocolate note, with a modest sweetness provided by some mid-range crystal malts. The roast character is slightly overbearing compared to the sweetness, although this was deliberate as I left “space” in the flavour profile for the caramel/vanilla character we are expecting to be contributed by the bourbon barrel that the main portion of the beer is ageing in. Aftertaste is a lingering coffee/chocolate note and a subtle sweetness that grows as the roast fades. The hop character is predominantly bitterness, with enough bitterness present to balance the sweetness of the beer. Mouthfeel: Big bold body, modestly effervescent, and somewhat silky. Early on there was a bit of an alcoholic burn to the beer, but this has since faded and is no longer present. Overall: Pretty much exactly as planned – big roast and chocolate notes, but not overly complex in order to allow the barrel-aged character to shine through. The barrelled portion still has a few months to go, and I am looking very forward to tasting that version…and to seeing how it ages over the months and years to come. 1/4 shot of bourbon (per ~300 ml beer): Not much of a change, but a subtle vanilla note is now present. 1/2 shot of bourbon: Beer has a better balance of sweet notes to counteract the roast of the beer. The bourbon provides a strong vanilla character that balances nicely with the chocolate character of the base beer. Overall the beer is smoother and softer on the palate. 1 shot of bourbon: There is no longer a need to barrel age. The balance is spot on; a perfect mix of sweet, vanilla, roast and hop bitterness. I may drink all my stouts this way in the future. 2 shots of bourbon. Vanilla is now a little over the top, and the beer is getting a slight alcoholic burning sensation. 3 shots of bourbon: Smelling the beer burns a little, and the beer has a very strong alcohol note. Bourbon character now dominates, with the stout providing a subtle complexity that works quite well with the bourbon. 4 shots of bourbon: At this point I’m pretty much rinsing stout residue out of my glass with bourbon. This is what the tears of angels taste like. Also, the room is “spinny”. 5 shots of bourbon: Now I’m just sitting in my basement, with the lights out, drinking bourbon.